Marie Claire magazine is now collaborating with Kate Spade to come up with this on pack promo. 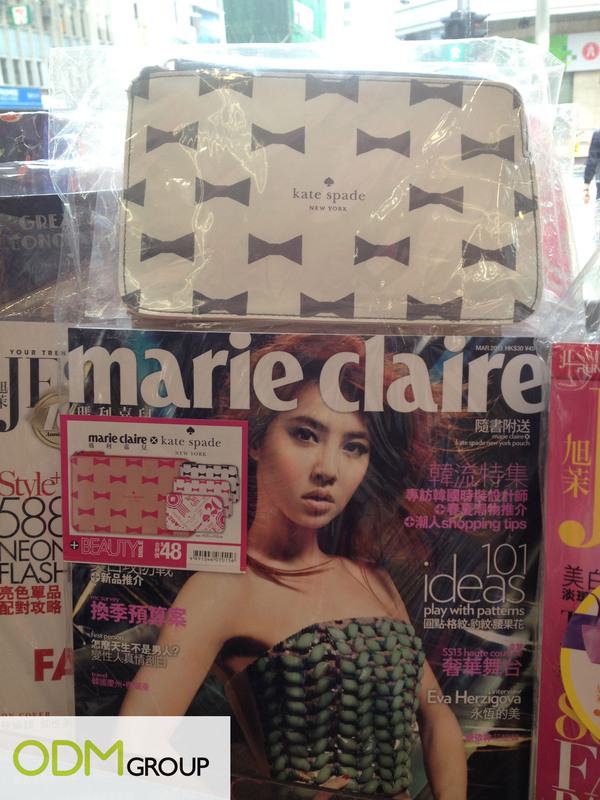 Simply purchase a Marie Claire magazine to get a Kate Spade pouch at a more valued price. This on pack promo package was found in Circle K, a convenience store in Hong Kong. The whole package only costs HKD$48 and you could get both of the items. Read on to find out more about this promotion. Marie Claire is today’s magazine for the fashion-minded women. It is women’s source for information on fashion, style, beauty, women’s issues, careers, health and so much more. Kate Spade sells a variety of products ranging from handbags and clothing to jewelry, shoes, fragrance, etc. A very renowned brand which has over 80 retail shops and outlets across United States and more than 100 shops internationally, Kate Spade specializes in selling colorful products. Sales for Marie Claire magazines would definitely be increased with the introduction of this on pack promo. By purchasing this package, readers are able to receive a Kate Spade pouch as well. Furthermore, Kate Spade lovers might even purchase this on pack promo just for the pouch. This way, Marie Claire would be able to reap more profits. Branding the pouches would also aid in boosting sales for the magazines. Brand awareness is enhanced when Marie Claire’s brand is imprinted on the Kate Spade pouches. Others who pass by users of the pouches would be able to learn of Marie Claire. Brand recall would be reinforced when people use the pouches. Marie Claire has collaborated with Kate Spade, an internationally renowned brand. By collaborating with a prominent brand in the market, sales would be boosted. People recognize Kate Spade, and thus, would be more willing to purchase Marie Claire’s magazine. People would also trust that these Kate Spade pouches are authentic since Marie Claire is a distinguished magazine brand in Hong Kong.